A group of scientists, including EMBL’s Lars Steinmetz, have developed an inexpensive yeast single-cell RNA sequencing (yscRNA-seq) method that is sensitive enough to explore the architecture of RNA transcription in individual yeast cells. The team’s new protocol has significantly reduced the cost of yscRNA-seq to $12 per cell. They used it to measure the expression of genes in clonal yeast populations and investigate any differences between the cells. The expression levels of cell-cycle and metabolic genes were found to vary the most. These variations gave individual cells a competitive advantage and an increased ability to withstand corresponding environmental challenges. Developing high-throughput methods for analysing single-celled microorganisms such as yeast presents several challenges. The yeast cells studied are small, 2-5 μm in diameter. They contain particularly dense transcript spacing that makes identifying transcription start sites difficult. The surrounding, hard cell wall also poses a literal barrier for studying RNA: removing the cell wall to get to the RNA can alter the RNA in the process. The scientists believe the new protocol could potentially replace older, conventional RNA-seq techniques. Additionally, it allows microbiologists to answer complex transcriptional questions that the older processes could not, such as the identification of more rarely expressed genes that would be lost in the data of conventional RNA-seq. What is single-cell RNA sequencing (scRNA-seq)? The first step in gene expression is when a gene in an organism’s DNA is used as a template to make a closely related molecule, known as ribonucleic acid (RNA). RNA molecules are involved in a range of functions within the cell, such as carrying instructions for making proteins, and helping to assemble them. 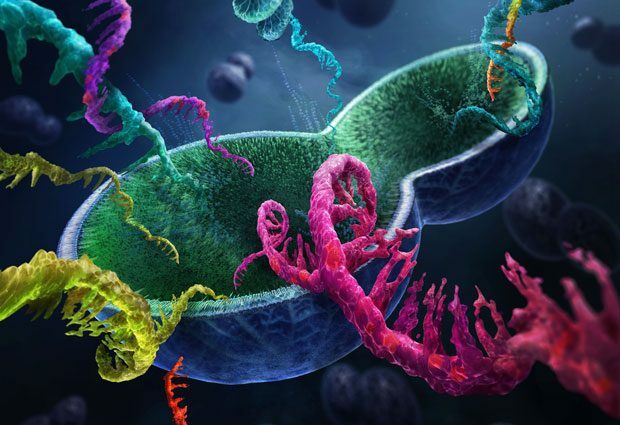 RNA sequencing (RNA-seq) is the process of finding out which of an organism’s genes are being expressed by looking at which RNAs are present in its cells. In bulk RNA-seq, the RNA in a large cell population is analysed. This will often contain RNA from many different types of cell and separating the data for each type can be difficult. Sequencing single cells (scRNA-seq) is a slower and more challenging task than testing in bulk, but allows more rarely expressed genes to be identified. Data on these genes would normally be lost in the noise of bulk RNA-seq. The amount of biological material in a single cell is so small that not all RNA properties can be identified in a single attempt. Scientists use cell-sorting techniques to separate cell types based on parameters such as size and shape. They then use statistical methods to combine results from scRNA-seq of individual cells of the same type and study the patterns of gene expression. A major focus of current research is the development of techniques that allow this testing of individual cells to be carried out quicker and in larger numbers (high throughput) on different types of cell.